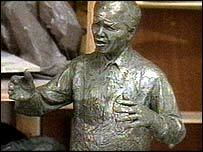 A statue of Nelson Mandela may soon find a home in Parliament Square. The London mayor's plans to place the 9ft (2.7m) bronze statue in Trafalgar Square were blocked last year by Westminster City Council's objections. But people from the council, the Nelson Mandela Statue Fund and the Greater London Authority have begun talks. about the Parliament Square option. If all sides agree, Nelson Mandela may find himself near other great leaders like Sir Winston Churchill. Other statues in the square include Lloyd George, Abraham Lincoln, Benjamin Disraeli and George Canning. "There does seem to be some degree of optimism that some sort of agreement can be reached," a Westminster Council spokesman said. "The clock would start ticking as soon as we have a planning application. With all this pre-planning hopefully it would be a matter of months before it would come through." The £400,000 statue, featuring a bronze sculpture by Ian Walters, could be placed on its own on Parliament Square's west side near Westminster Abbey. Canning Green is another possibility and would see the anti-apartheid leader and former South African President positioned between Abraham Lincoln and George Canning. In December Deputy Prime Minister John Prescott upheld a public inquiry's decision to refuse permission for it to be placed on the north terrace of Trafalgar Square, which was London mayor Ken Livingstone's preferred option. The council was backed by English Heritage and the National Gallery.